We've been out RV'n for 5 months and finally rolled in to the city a few days ago. 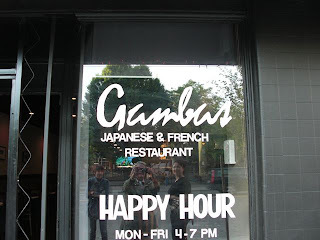 Tonight, we were able to have dinner out with our good friends A and G at a new place they have discovered called Gambas. Japanese/French - hmmm - doesn't really compute. Gambas is a minimalist little hole in the wall that serves up delicious fare, both Japanese and French. JC doesn't do sushi, so he was excited to hear the "French" after sushi when I told him where we were going. JC opted to start with the chicken sausage gumbo. It was delicious. 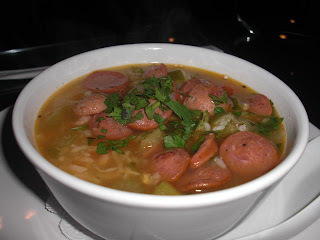 Now, since we are from the south, I have to tell you it is not the southern cajun, clear your sinuses gumbo that you might expect, but a very light sausage and rice concoction with a definite asian influence. My friend G had the madako baby octopus salad served with a pepper cilantro vinaigrette. I forgot to take a picture (sue me - I'm new at this!!!). She ate every bite so it must have been good. 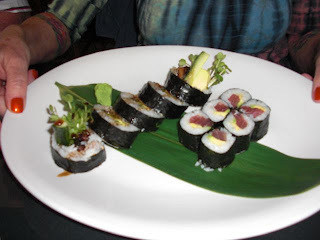 She also had a tuna and avocado and an eel roll. Both of which were delicious. I had the avocado salad - lovely. 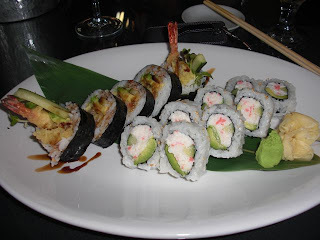 And a california roll and a shrimp tempura roll - also lovely. Our friend A is a frequent customer here and they are happy to make a special california roll substituting scallion for the cucumber. 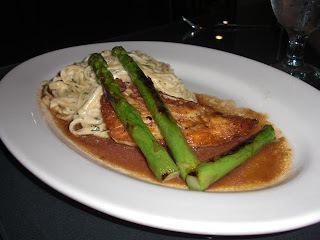 JC also had the halibut, pan seared and served with lobster fettucini and gargantuan asparagus - YUMMY. We will definitely eat here again and - WAIT - Japanese/French does compute!! Hmmm - tempura = fried - well of couse I can't resist them!! We'll try the Happy Hour when you visit!